Global Solar PV Module Market size for 2016 was valued over USD 20 billion and the annual installation is set to exceed 100 GW by 2024. Favourable government initiatives including soft loans, tax subsidy and feed in tariff (FiT) coupled with renewable energy integration targets will stimulate the global solar PV module market size. Introduction of net metering and power purchase agreements will further stimulate the business landscape. Paradigm shift from conventional to sustainable energy sources for electricity generation will propel the global market. Rising concern toward greenhouse gas emissions will further thrust the industry growth. In 2016, British Columbia in Canada implemented the Greenhouse Gas Industrial Reporting and Control Act, which defines standards and emissions norm to be abided by industrial power generators in the region. Declining solar component cost owing to increasing manufacturing facilities, financial leveraging and economies of scale will drive the solar PV module market price trend. Intense competition, fall in polysilicon prices and increasing manufacturing efficiencies will further complement the business outlook. In 2016, global average panel price witnessed a drop of over 20% from 2015 levels. Thin film in 2016 accounted for over 20% of global market share. Improved efficiency, flexible integration and increasing R&D spending towards cost competitive deployment are some of the salient features, which will boost the product demand. Increasing demand for cost competitive technology coupled with adequate technical and financial assistance will drive the crystalline silicon solar PV module market. Growing environmental concerns along with high operational efficiencies will further propel the business size. In 2017, a collaborative research team from École polytechnique fédérale de Lausanne (EPFL) and Center for Electronics and Microtechnology (CSEM) at Neuchâtel introduced latest technique for creating crystalline silicon cells with an aim to enhance module efficiency to 23.2% with potential of complying to 26%. Monocrystalline PV module market share is projected to witness gain over 6% by 2024. Increasing demand for energy efficiency and optimum resource utilization will propel the industry growth. Declining price with advancement of technology will further augment the industry landscape. 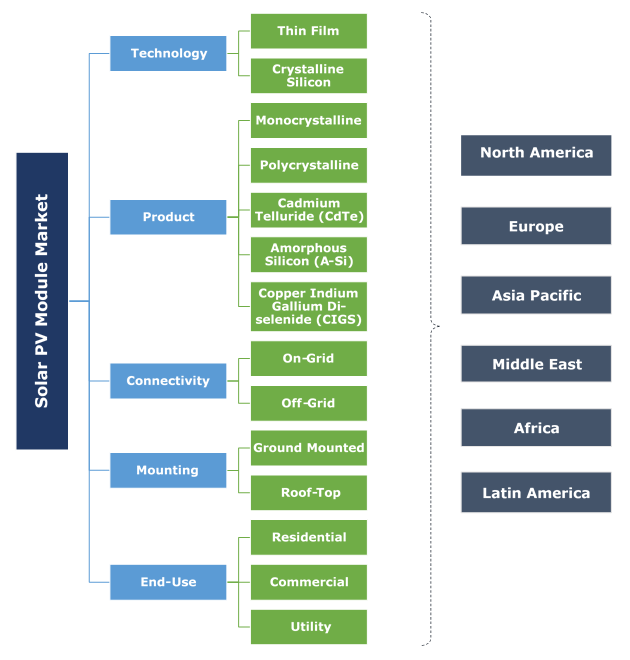 Increasing investment toward utility installations coupled with declining component cost will positively drive the polycrystalline solar PV module market. In 2017, Fraunhofer Institute for Solar Energy Systems ISE developed a polycrystalline technology exhibiting an overall efficiency of 21.9%. Increasing penetration of renewable energy across the globe coupled with growing energy demand will further complement the business outlook. On-Grid accounted for over 55% of the solar PV module market share in 2016. Ongoing electrification programs along with favorable government initiatives pertaining to grid connected power generation will stimulate the business. Growing deployment of micro-grid network with increasing demand for off grid electricity from rural areas will drive the industry size. In 2017, The United States Trade and Development Agency awarded a grant to Community Social Enterprises Ltd. (CESEL) to carry out a feasibility study for its plan to install 25 off-grid solar photovoltaic microgrids in Nigeria. Ground mounted solar PV module market is anticipated to witness growth over 7% by 2024. Growing demand for commercial and utility scale installations coupled with ongoing rampant of industrial expansion will fuel the industry growth. Declining component costs coupled with introduction of government initiatives including FITs and subsidies will positively impact the growth. Ongoing government program towards implementation of rooftop systems with an aim to reduce carbon footprints will embellish the market. Introduction of subsidies and net metering may encourage the adoption of these systems. Asian Development Bank announced grant of USD 500 million towards rooftop systems, which will help the Indian government to increase its renewable energy penetration. Residential solar PV module market size for 2016 was valued above USD 4 billion. Rampant deployment of roof-top system subject to government incentives, net metering, subsidies and other benefits for renewable integration will thrust the business landscape. Ambitious plan to reduce the carbon footprints along with growing demand for clean and reliable electricity will drive the utility market. National solar targets and renewable integration initiatives coupled with FiT, tax benefit and other leveraging provided by regulators will boost the product demand. The U.S. solar PV module market share is set to expand over 6% by 2024. Rising investment towards development of energy optimization coupled with strict regulatory norms against GHG emissions will augment industry growth. Ongoing deployment of micro grid with growing focus towards adoption of sustainable energy will stimulate the business growth. UK market for 2016 was valued over USD 650 million. The Government of UK launched the export tariff scheme, which provides USD 0.06 per unit for surplus electricity fed back to the electric grid. Favorable government initiatives with ambitious plan to reduce carbon footprint will further complement the business landscape. Growing measures toward energy mix and optimized energy resource management will significantly drive the Brazil market. Government initiatives including BNDES’s LSRs, mandating assembly of PV modules in the country will boost the product installation. China solar PV module market accounted for over 60% of the Asia Pacific region share in 2016. Growing investment towards renewable integration along with ongoing electrification program will complement the business growth. China Energy Agency has announced an investment of USD 361 billion into renewable technology by 2020.
Notable participants in the industry include Trina, Canadian Solar, Jinko, JA Solar, First Solar, Yingli, Hanwha Q-Cell, SFCE, ReneSola, SunPower, Vikram Solar, Lanco, Su Kam, GCL, Moser Baer, Shine Solar, Motech Solar, Hareon and others. Turnkey solutions and rigorous technological R&D have integrated a competitive business scenario. The industry has witnessed a steep decline in the levelized cost of PV installations and have propelled substantial penetration in comparison to auxiliary energy resources. These panels are primarily deployed by utilities, industries and residential consumers for effective electricity generation owing to rising environmental concerns and cost competitive prices. Government initiatives along with rising demand for off grid electrification play a vital role in the industry growth roadmap. In the recent years, clean electricity demand has witnessed comprehensive upsurge with growing urbanization coupled with renewable integration targets which in turn have significantly impacted the PV panel demand.